Ask just about any Jordanian what food you have to try when you visit Jordan, and you’re pretty likely to hear mansaf as the top answer. Mansaf is a dish of rice, lamb, and a dry yoghurt made into a sauce called jameed. It’s not only one of the the most beloved Jordanian foods, but it’s also considered the national dish of Jordan. I’m not saying mansaf is the single dish you have to eat in Jordan (there are many other dishes you should try as well), but it’s the one dish – if you had to choose just one – that you don’t want to leave Jordan without feasting upon. 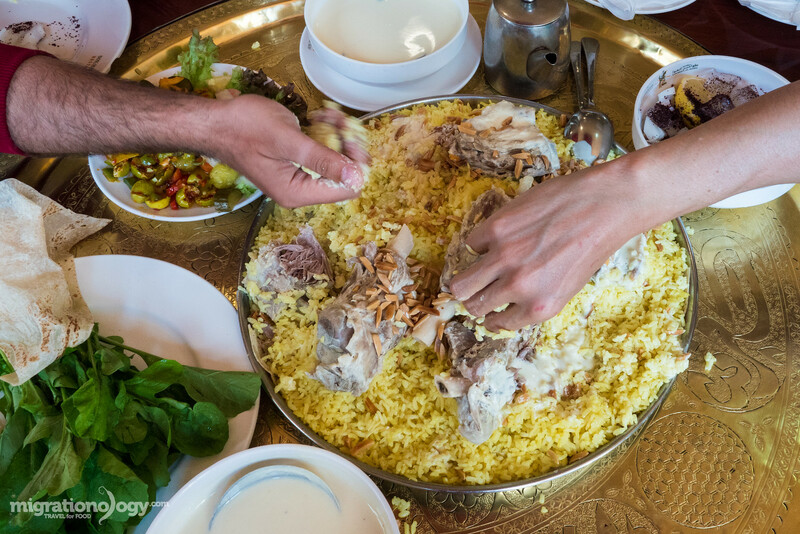 There’s a certain Jordanian pride and significance that goes along with mansaf – and once you taste it, and experience a communal meal of it, you’ll know why. 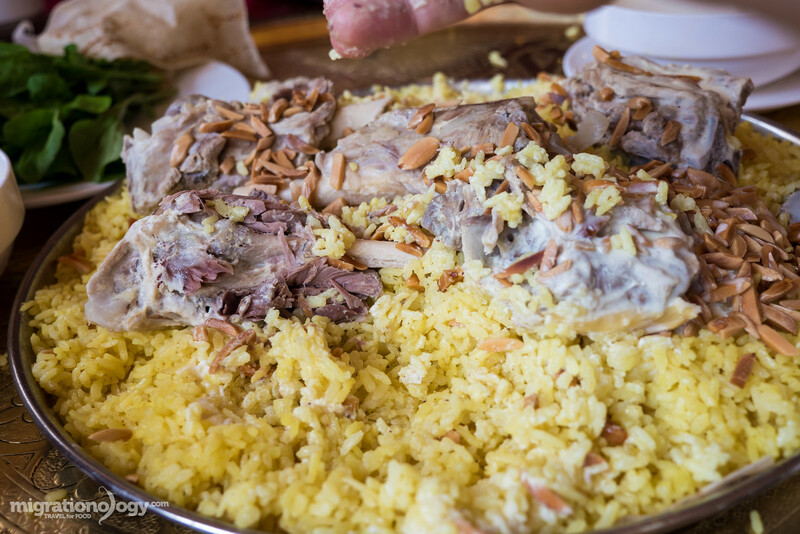 Mansaf is a food that runs deep in the culture of Jordan, and when you take your first bite, you’ll actually taste Jordan. Along with just being completely unique and delicious, mansaf is so important in Jordan that it’s been known to resolve conflicts and restore peace with tribes in Jordan – that’s the power of food. It’s also common to eat at Jordanian celebrations, parties, family get-togethers, and festivals. 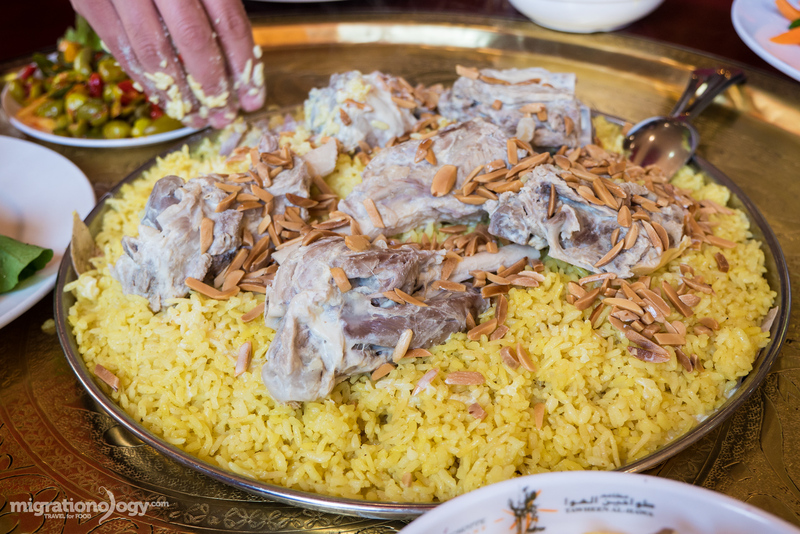 There are only a few main components of any platter of mansaf; rice, lamb, jameed (more about this below), and lastly nuts and shrak (a type of bread) are also commonly present. The rice and lamb are both wonderful within the dish, but it wouldn’t be mansaf without jameed, a special dried and fermented goat yoghurt. Jameed is Bedouin style dried and hardened laban, which is strained goat yoghurt, dried into hard balls. On top of Bedouin tents, you’ll often see balls of jameed dehydrating and hardening in the hot sun. To make mansaf, the lamb is cooked in jameed, and the sauce, which goes along with the rice and lamb, is re-hydrated, and prepared into a thick gravy to go with the lamb and rice. The jameed gravy is salty, has a sour fermented yoghurt flavor, and you can definitely taste the goat in it. Mansaf, sold by the kilo! When my wife Ying and I were in Amman, Jordan, we went to a restaurant called Tawaheen Al Hawa (also known as Don Quixote), with a specific purpose to eat mansaf. The restaurant is a huge institution in Amman, possibly one of the biggest restaurants in the city, with multiple dining rooms – it’s the type of restaurant that friends, and families, and party sized groups come to hang out, celebrate, and feast. You might be interested in my Amman Travel Guide here. Tawaheen Al Hawa, while they have an extensive menu of Jordanian food, including all the typical mezze dishes (hummus, moutabel, ful, tabbouleh etc. ), the main dishes they are most famous for are mansaf and grilled meats, like kebabs. We came for the mansaf. For most of our other meals in Jordan, we ate a whole bunch of appetizer dishes like hummus and moutabel prior to our main dishes, but when you eat mansaf, it’s customary to get straight to the main dish without messing around with all the dips and sides. 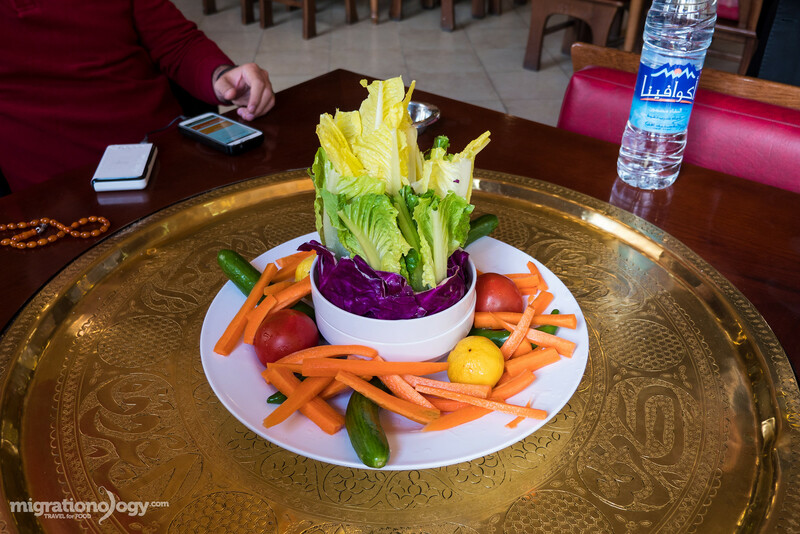 However, they did serve us a massive platter of fresh raw vegetables stacked up into a sculpture of colors. I loved how they included whole cucumbers, tomatoes, lettuce, purple cabbage, and even whole lemons tossed on the plate. As we munched on some pre-lunch vegetables, I had a cup of Arabic coffee, a beverage I grew to love while traveling in Jordan, and also a cup of lemon mint juice. 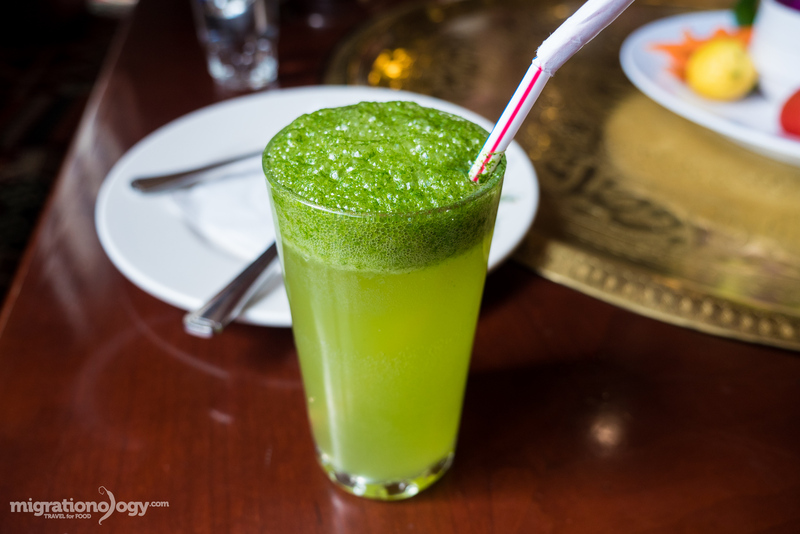 Lemon mint juice is a popular drink in Jordan and throughout the Levant that includes lots of lemon juice, blended with mint, and ice, and can range from extremely sweet, to barely sweet at all. The lemon should be so strong that it makes you squint a little on your first sip, and the mint complements the strong lemon sourness so well. The lemon mint at Tawaheen Al Hawa was a little on the sweet side for me, but it was very good, and as always, very refreshing. At just about every restaurant you eat at in Jordan, there will be a complementary jar or plate of olives on the table. 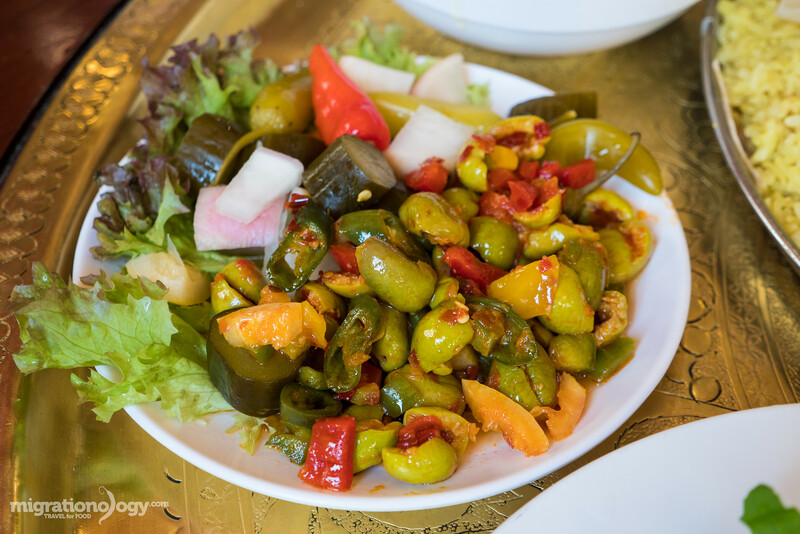 At Tawaheen Al Hawa, one of their other specialities is chili olives. The olives were nice and salty, and had a wonderful chili addition to them. Being a chili addict, these were some of my favorite olives I had during my trip to Jordan. And then the mansaf came! A giant communal metal platter of yellow fragrant rice, topped with extremely tender pieces of lamb scattered on top, sprinkled with a good handful of fried nuts (I’m not sure if they were pine nuts of sliced almonds), and finally topped with a layer of shrak, a type of thin bread similar to a tortilla (there was also shrak on the very bottom of the rice as well). The mansaf was served with bowls of jameed on the side, plus a bowl of white onions topped with sumac, and a plate of fresh rocket (arugula) to garnish. While at Tawaheen Al Hawa it’s perfectly acceptable to eat with a spoon and knife, to truly get a taste of mansaf, I think it’s best if you at least attempt to eat it the traditional way – plus I’m a huge fan of eating with my hands – the touch of the food just adds another sensory dimension to a meal experience. I’m by no means a mansaf eating expert, this was my first time to try this unique and amazing dish, but I’ll do my best to try and explain the basics of eating it. Typically in a traditional setting, the mansaf platter would be placed on a table, and you would stand around with all the other eaters, left hand behind your back, and eat only with your right hand. 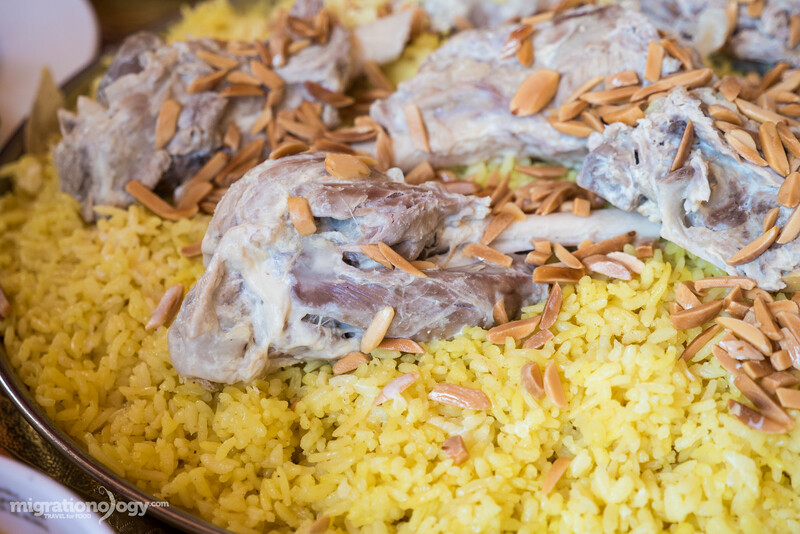 After some jameed is poured over your rice and lamb, you first grab a piece of lamb, mix it with rice on the platter in your fingers, and when you have a good amount, you transfer the rice and piece of lamb into your palm. Within your palm, you start to shape it into a ball form, keeping the piece of lamb in the middle of the rice. I found that you don’t really want to squeeze very hard, or all the rice will sticky to your hand. Instead, just sort of rattle the rice around in your palm and so long as there’s the right amount of jameed in your rice, the grains should begin to stick to each other. It took me a few mansaf ball trials, but you definitely get much better, even after rolling just a few balls. 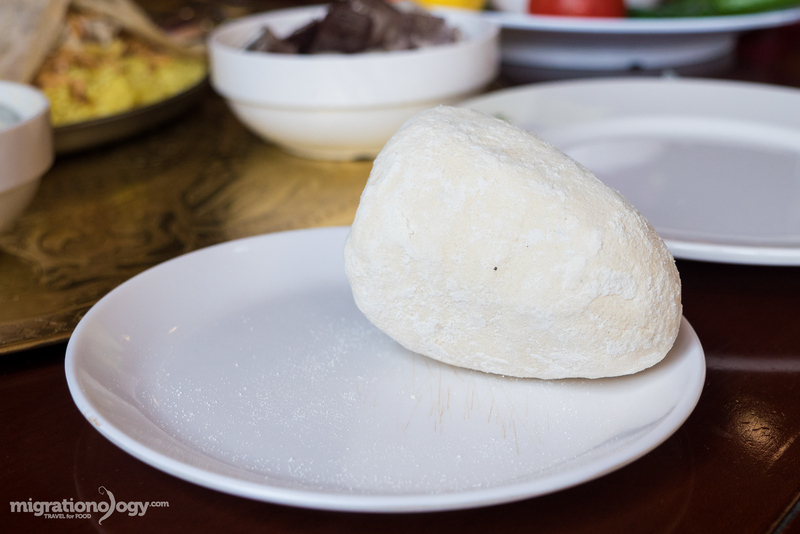 After you have a nice mansaf ball, you then eat then entire thing in one bite – a bite that includes rice, lamb, and jameed. Your fingers should not touch your mouth or lips, so you almost need to drop the mansaf into your mouth – this was fun. Then repeat, and repeat again. And keep eating until you’re stuffed. 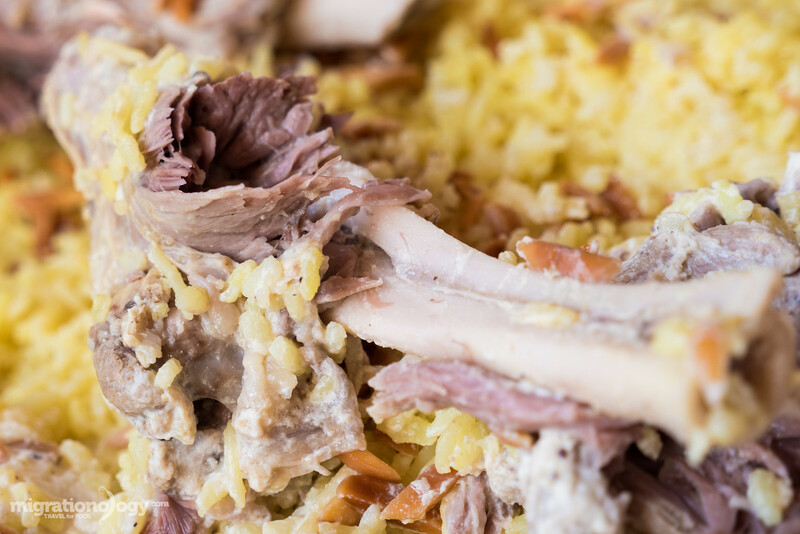 Mansaf is a Jordanian meal you won’t walk away hungry from. Before I tasted the balls of mansaf, I was served a cup of the jameed gravy to sip on. Made from goat yoghurt, it had quite a strong flavor, as in, you could actually taste the pastures and herd of goats within the jameed. In addition to the meaty goat flavor, it also had a sour yoghurt taste, and it was salty, rich and creamy. Taking my first bite of jameed, I immediately loved it, and although in yoghurt form, it reminded me of eating fresh grilled goat in Tanzania; It had that delicious taste of literally a pasture of grass turned into meat. The rice itself, on its own, was relatively plain, I believe just cooked with turmeric to give it its yellow color, and perhaps a bit of salt and flavoring. The lamb, cooked in jameed, had a slight sour and salty taste, but for the lamb it was all about the tenderness of the meat. Using just fingers (no knives ever needed), the meat slipped off the bone with zero effort. 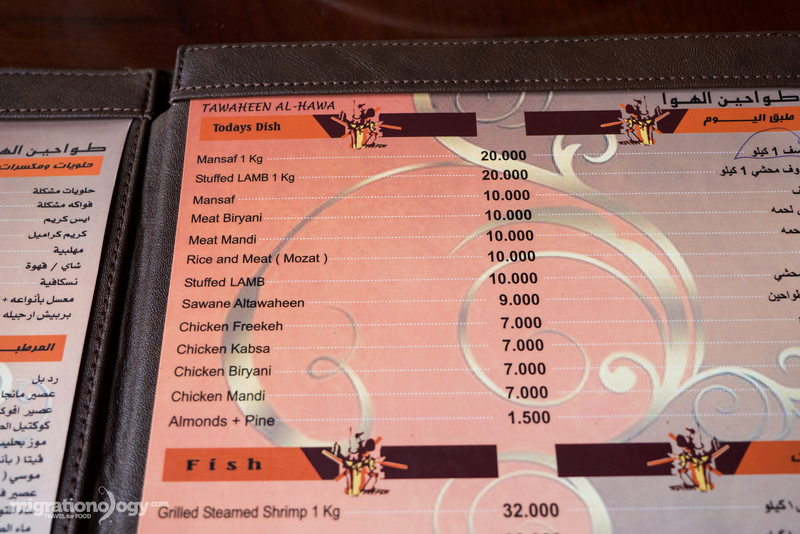 One of the things the manager at Tawaheen Al Hawa mentioned to me is that at the restaurant they use only local Jordanian lamb, as opposed to imported lamb. The lamb from Jordan, known for being delicious because it’s still free range and feeds upon desert shrubs, was incredible. The combination of each bite, all wrapped up with stuck together with plenty of jameed, was sensational. 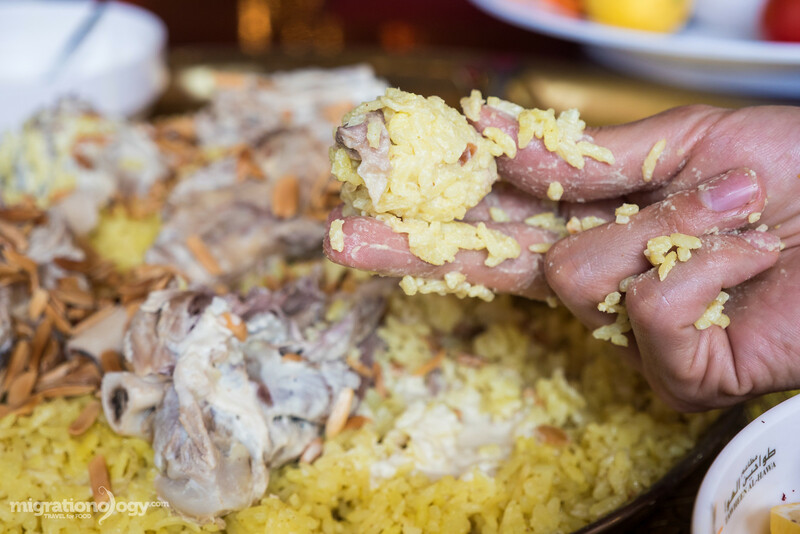 When you finish eating mansaf, if you eat with your hands, your hand should be covered in slightly dried out yoghurt with grains of rice stuck here and there. The best part is, as long as you’re not planning to dip your hand back in the communal plate (meaning you’re full and done eating), you are allowed to lick your hand clean. That’s an awesome rule. 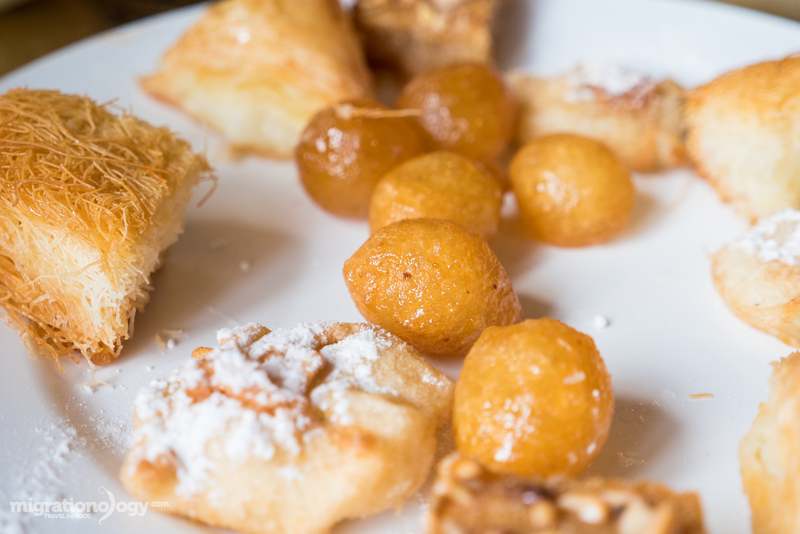 I’m not big on desserts, I could have been more than satisfied just with my final bites of mansaf, but desserts are very popular in Jordan, and they served us a big plate of assorted Middle Eastern sweets. What I did like was the giant plate of fruit they also served. I ended my meal with a few slices of juicy orange, a perfect dessert for me. 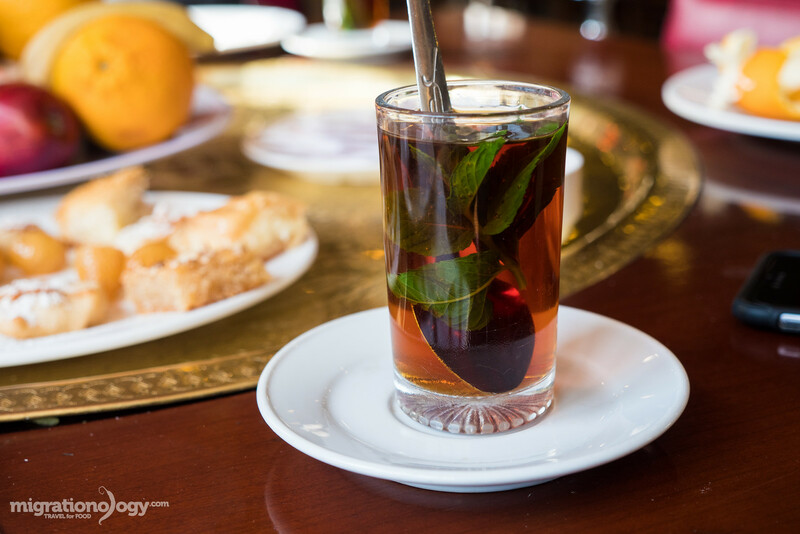 And finally, if there’s one thing that sounds good after a belly full of lamb and yoghurt, it’s hot tea with fresh mint leaves. It was an excellent way to relax and calm down after such a sensational Jordanian mansaf feast. Not only is mansaf one of the best dishes in Jordanian cuisine, but I would put it pretty high on the list of amazing must-eat meals in the entire world. The soft tender lamb, the fragrant rice, the unique jameed goat yoghurt sauce, and the method and tradition that surrounds eating it, truly makes it a meal worth traveling for. You’ll find mansaf at many different restaurants throughout Jordan, but if you’re in Amman, Tawaheen Al Hawa does it well. Be sure to check out my full Amman travel guide for more restaurant suggestions and travel tips. How to get there: The best way to get here is by taxi, and it’s located a little ways from the center of Amman. Disclosure: The Jordan Tourism Board invited my wife and I to visit Jordan on a food trip, and this was one of the amazing restaurants we ate at during our time in Amman. Hello! I’ve just found your page and was introduced to mansaf by you. Really glad I’ve found this page and looking forward to experiencing more foods with your recommendations! Best video… serious! Made my own yogurt, lettuce, cucumber and chile paste –it’s AWESOME. Thanks for your wonderful Jordanian food travel extravaganza — hope to do the same again soon! Hello Mark, My name is Soma from India, married and mother of two child, by job I am a home maker,I am a great fan of you and your YouTube videos. I really enjoying to watching your videos. I’d love to see again and again your YouTube videos in future. Congratulations for your little Myka. Say hello to your wife…I really like her for her appreciation in all aspects. Hope you all are fine. Regards. Hi Soma, great to hear from you, thank you very much for sharing a little about your self. Hope you and your family are all doing well also! 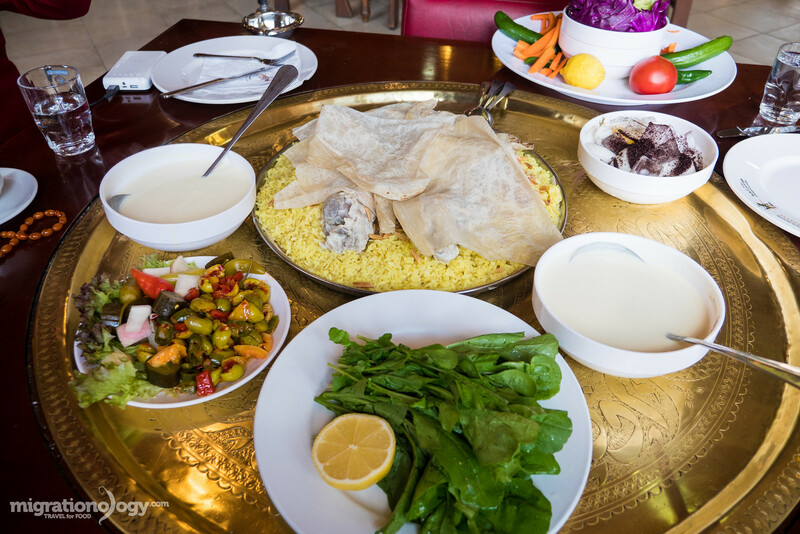 Mansaf is one of the best dishes in Jordanian cuisine. Go to any authentic Jordanian restaurant even in US, and you will find it there. rated very highly. BY the way ,most of the lamb meat is also imported by mostly one company , a very well connected , may I add . The meat is imported from Hungry. Bulgaria ,Roumania ….. I won’t call that a national dish ,when most items in it are imported . @former!! Jordanian…respect Mark’s blog and stop posting many uneducated comments…Mansaf warrior! chill out dude! The manager mentioned that the lamb in this mansaf was Jordanian lamb! Hey you, ” troll” stop spewing hate on Mansaf, if you don’t like it or don’t want to be a Jordanian anymore go elsewhere, I’m a Jordanian / Palastanian and the very hearty Mansaf is on top of my favorite dishes, it is the national dish here, some cook with an imported lamp because it’s cheaper, but it doesn’t make it less national (the meat won’t be as tender though), it did influence neighboring countries just like how we’re influenced with many of their cuisine, lastly it is a heavy delicious dish but there are dishes that’s far heavier, and it will not kill anyone if eaten once a month or less, people indeed cook chicken instead of lamb with it but I don’t call that an original Mansaf, just another tasty meal. Hey Reem, thank you very much for your support, appreciate it. And glad mansaf is one of your favorite food – it was my first time to try it, and I loved it as well. Your tip for making mansaf at home sounds delicious! I think after I read your opnion about MANSAF that’s you are one of the sick persons that lives in Jordan and jealous from our culture , because if you are a real Jordanian as you claim , its mean that you will use local lamp meat instead of imported meat, I catches you. if you are former Jordanian please shut your mouth and let the real Jordanian talk. thanks Mr. Mark Wiens , for your great description to our best dish in Jordan , and hope you will visit Jordan and try MANSAF at my home. It’s consumed not just in Jordan ,buy also countries around Jordan with different variations .That said , the traditional Jordanian mansaf is not this . It was made with wheat seeds and or bread . Rice ? Imported from Egypt . Wheat ? In the old days before the Wheat fields in Karak and Salt dried , but now ,most likely imported from the USA or Canada or some other country . Salt ? : From Jordan . I give you that one . Spices : Nowdays ,most likely far east …. India ,Sri Lanka , China . Jammeed : imported from Syria and some locally produced . Loaded with Salt >high blood pressure . Loaded with Fat > Heart disease ? type 2 diabetes ? Obesity ? Too much meat > Kidney disease ? White rice and white bread : Brown, Black, Purple and Red rice is health food Unlike White rice . >>> Insulin blood suger issues in Jordan speaks valume for that one!! Jordanians like to brag and make things bigger than what they are . for most Jordanians if they eat Mansaf just once a week , that means , they won’t have money to pay the rent . What is the AVG salary in Jordan ? and the cost of Mansaf ???? Former Jordanian obviously knows what he/she is talking about, whereas Mark Wiens was paid by Jordanian Tourism to make it seem all wonderful and healthy. No real review here from Mark. Just another paid gig. Disgraceful! You are wrong Damien. This was sponsored by the Jordan Tourism Board, but this was not a paid gig, nor did I have to write about this place – it was my choice to write this. Hope you can try mansaf in the future! Former Jordanian is wrong! funny he’s calling himself “former! !” Jordanian! I am a Jordanian with a mixed heritage (Jordanian and German) living in the US! what Mark displayed is accurate. It’s originally a Bedouin food, and consist of whatever resources available for the Bedouins mainly (Lamb meat, rice/bulgur, Jameed/dry hard yogurt prepared from goat Milk) nowadays people add other things to it…mainly for decoration or to give it other taste dimensions! like adding pine nuts and/or almonds, herbs etc…that being said, and although it’s called Jordan traditional dish it can be found in “Palestine, Iraq, Syria, and Saudi Arabia” and there is no stranded “version” of it! for example in Palestine, Syria they use Chicken instead of Lamb meat, in short, it’s a healthy meal, rich of vitamins (see link below) simple and delicious…the only thing I do not do is eating it using my hands or sharing the main plate. Thank you very much Ash, appreciate your helpful comment. Watching mansaf and the video I think it looks very much like the Lucknow style biryani in India. Similar colour as well as the mutton is cooked similarly. Each and every dish of Jordan is looking so delicious and the Hummus! Hopefully will be travelling there soon. Hey Abhishek, awesome to hear that, I would love to try Lucknow style biryani. Thank you, hope you can visit Jordan in the future! I sure do wish licking your hand after a meal was something I could do anywhere! This meal sounds not only delicious, but an interesting experience. I love all of the elements that come together to make the dish what it is. Plus the drinks and the appetizers and the whole shebang! I know close to nothing about food in Jordan, so this was a nice introduction! Hey Katie, I agree, that would be great. Thank your for reading! Oh my gosh, I love this blog! I love traveling and food. Both is ideal! That lemon-mint drink looks super refreshing. I love when there’s a foam! Little history : Mansaf evolved .In the old day , it was made of wheat berries not rice . The additions of rice is new . They used to call it ‘ a complete meal’ , which is far from the truth , because it lacks vegetables . that said ,it is loaded with weeks worth of sodium , cholesterol , saturated fat , and it has very little fibre , if any . The old spice mix added to it is called Jadeh جعدة and was collected from the hills of alsalt / aljlon / Madaba . The Ghee used is a yellow colour fat called ‘saman balgaweeسمن بلقاوي .from around madaba and alsalt. Karak is the centre of Jammeed جميد . I love to see you try Asian food in Jordan and compare it to a real far east Asian country . By the way , where was the head and tongue of the sheep on that mansaf ? that is the real Jordanian mansaf . 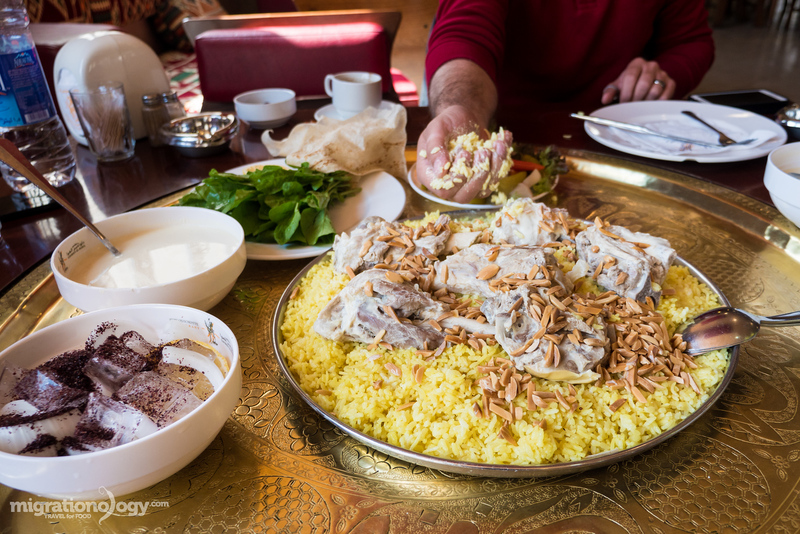 Mansaf seems like such a succulent dish … when I make it to Jordan, it will be the first meal that I will order! Amman is one of the most expensive cities in the region . Outside of Amman , where is the beauty of Jordan and the real food is, is totally different story . When people ask weather to visit Jordan , I always say yes , just spend most of your time outside of Amman once you get there . Think about it this way :Vegas prices verses San Francisco and San Jose . Thank you Frank, I think you will love it! They sure brag about it in all of Jordan , just the way the chicago cubs fans brag about winning .